Savory Saturday – Welcome Fall! Welcome to pumpkin AND chili heaven! Place all ingredients in a large saucepan, stir well to combine, and bring to a boil over high heat. Reduce to medium-low and simmer, covered, 35 minutes. Serve warm. This weekend was quite a busy time, filled with many friends, (not family – they happened to be in Paris!) and a TON of food. Preheat oven to 300F. Line a baking sheet with parchment paper. In a large bowl, stir flour with sugar, pumpkin seeds, pumpkin spice, baking powder and salt. In a separate bowl, whisk eggs with pumpkin purée, butter and vanilla extract. Pour egg mixture into flour mixture and stir to combine. Transfer dough to a lightly floured surface. Shape into 2 long, flat logs, about 2 in. wide and 1/2 in. thick. (Dough will rise as it bakes.) Sprinkle coarse sugar on top of logs, pressing gently so it adheres. Bake for 30 min, until centres are firm to the touch. Remove from oven and let cool 5 min. Reduce oven temperature to 275F. Using a serrated knife, cut logs into 1/2-in. pieces. Place cut-side down on the baking sheet and bake an additional 35 min. Cool completely on a rack. 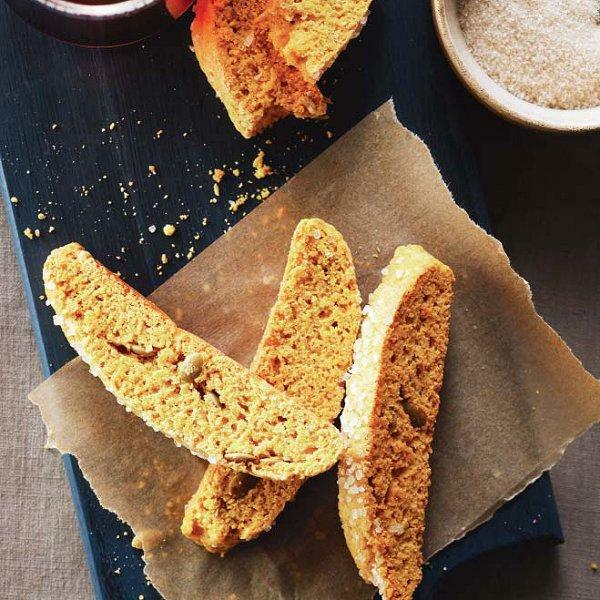 I am not a big dessert fan, but geez, I love my biscotti! Time to get out my jogging pants! !